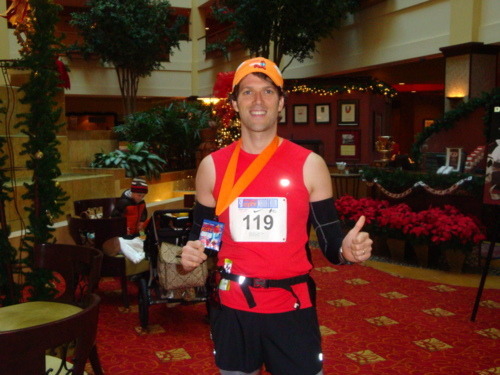 My Run: Overall, the Rocket City Marathon in Huntsville was my tenth full marathon completed. I decided to run this race for three reasons: (1) The close proximity to Nashville (2) We have very dear friends that live in Huntsville (3) Recommendations from running friends who spoke very highly of the organization and the small field. I have been very public about my “Quest for 3:15” this year, but my expectations coming into Rocket City were somewhat muted due to an inconsistent training schedule since completing the Bank of American Chicago Marathon in early October. I missed 5 days of training from being sick, and it took another 5 days to get my energy back once I was able to run again. Due to fatigue from racing, and from getting sick, I was not able to get in a 20-mile run until 2-weeks before race day. I had originally planned on doing one 20-miler and one 22-miler before Rocket City. Just as I was getting over being sick I hurt my back (re-aggravated an old injury). This did not prevent me from running, but did impact the quality of my runs for several days. After failing to make 3:15 at Chicago because of unexpectedly hot conditions (finished with 3:22), I had put my hopes on Rocket City thinking the smaller field and cooler temps would be conducive to faster times. But…with about a week to go before the race, I was really feeling like 3:15 was not going to be a realistic goal. However, several of my running friends convinced me that I had enough of a base built up after a year of consistent training to at least give it a shot. With this in mind I made the decision just before the race that if weather conditions were favorable I was going to go for it. On race morning it was cloudy with temps in the low 30s and a 10 to 15mph wind which made it feel rather crisp. The sun came out around mile 10 and the temps at the finish were close to 40. I would have preferred slightly warmer conditions, but this was awesome compared to Chicago. Even with the cold conditions I still went with a sleeveless shirt and shorts (with arm warmers, gloves, and a beanie), and actually felt quite comfortable for most of the race. I decided to run with the 3:15 pacer to help take my focus off of pace and splits and to try and get lost in the run. Olivia, Kate and Sara were at the start to cheer me on which got me going on a high note. The first 5 miles or so felt a little sluggish, but the pace was fairly comfortable. By mile 6 I began feeling really smooth and fell into a metronome-like rhythm. My mind was totally focused on the run and the miles clicked by faster than any race I’ve ever run. There were lots of turns in the first 9 miles with gently rolling elevation changes, but none of this broke my focus. Several people had warned me about a long, 5-mile stretch in the course beginning in mile 10, saying it would feel like it would never end. However, I probably felt the best during this stretch and the miles flew by. I just tried to make sure the pacer was always in sight and stay smooth. My first hint of lost focus came during miles 15 and 16 when the course turned back toward downtown. The wind was firmly in our face and it felt pretty cold. By mile 17 my focus was back and I actually ran out ahead of the pacer just slightly. I’ve found that sometimes when I’m following someone I subconsciously let them begin to pull away as I get tired. Also, I knew that my family along with our friends the Millers would be waiting for me during mile 18, and I didn’t want to miss them. When I saw them, I immediately noticed a giant “Go Tim” sign that Chris Miller was holding, and then saw everyone there cheering me on (more on this later). Kate even jumped in and ran a few strides with me. Even though I was starting to feel some fatigue in my legs, this gave me a boost that carried through mile 20. Looking back I think this was the best I’ve ever felt during the first 20 miles of a marathon. As we started mile 21 I was still running just ahead of the pacer and I heard him say that we would have a pretty good hill coming up. This turned out to be the biggest incline on the course and lasted almost 1/2 mile. While I wouldn’t classify this as a major climb, it was enough to get my attention. Halfway up the pacer caught me, and by the time we reached the top he was several strides ahead. After cresting the hill I felt my legs fill with lactic acid and they felt like lead. I was hoping this sensation would fade, but it kept getting more intense. I managed to still squeeze out a 7:32 for mile 21 and 7:35 for mile 22. I was hoping that I could keep the pacer in sight and then catch him with a big kick at the end. However, during mile 23 the wheels came off the bus. I wanted to stop and walk with every ounce of my being. At the Medtronic Twin Cities Marathon last year I also held 3:15 pace for 22-miles when the wheels fell off. In that race I gave in and finished the race with a mixture of walking and jogging, losing 10 minutes over the final 4.2 miles (Finished with 3:25). This time, I was determined I was not going to stop running. Miles 23 to 25 were brutal, and I quickly lost sight of the 3:15 pacer. It was also during this point that about 1/2 dozen other runners caught and passed me. This was demoralizing. 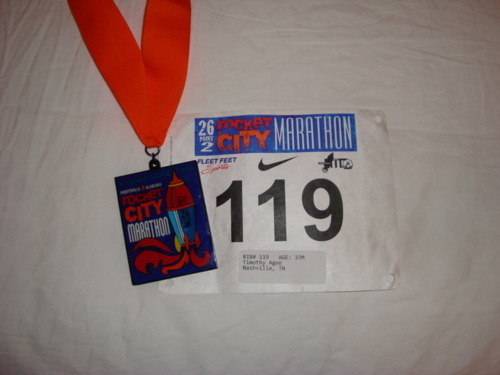 Since 3:15 was long gone I tried to keep my focus on setting a new PR, which meant besting my Chicago time of 3:22:24. I just tried to keep moving and finished these miles in 8:31, 8:41, and 8:29. Near the end of mile 25 I suddenly started feeling rejuvenated and began thinking clearly again. I calculated that if I could run the last 1.2 miles at under 8:00 pace I would break 3:20. With this as my newly modified goal I began to pickup the pace. As the course weaved through the downtown area toward the finish I started to catch and pass many of the runners who had passed me during the previous 3 miles. This felt really awesome. Once the finish line was in sight I again saw my family along with the Millers cheering hard. With this last boost I charged to a finish of 3:18:44, completing the last 1.2 miles with an average pace of just over 7:30. My finish was 88th overall out of 1130 finishers. Even though this fell short of 3:15, I was extremely pleased to set a new PR by 3 minutes 44 seconds. I’m also very satisfied to have hit the wall as I hard as I did and push through to a strong finish. My “Quest for 3:15” continues and I’ll just keep plugging away. Friends and Family: This was one of the few races this year that I did not do with a large contingent from our running group. 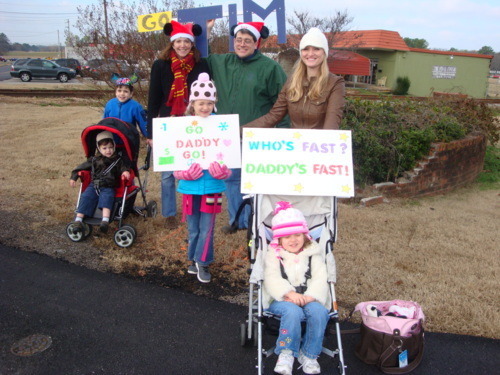 However, it it always really special to have my family with me, and was really sweet to see my daughters waving signs which read “Go Daddy Go” and “Who’s Fast? 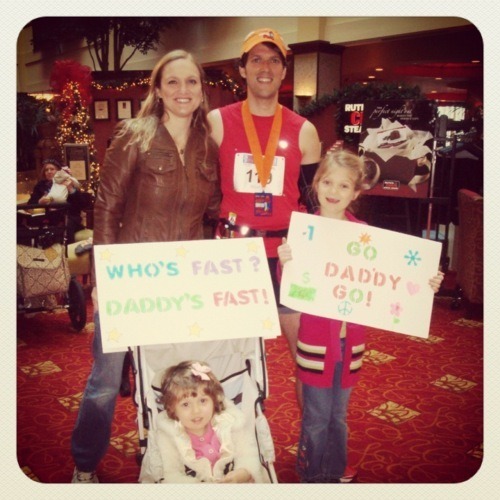 Daddy’s Fast!” It was also really cool for Kate to run a few strides with me at mile 18. Also, major kudos to Olivia for working so hard to allow me to sleep the night before the race when the girls were up half the night. It was also cool to be able to hang out with Chris and Jana Miller along with their two boys Joseph and Carson for a couple of days. They were also out there in the cold to cheer me on and Chris made a gigantic sign that said “Go Tim,” which I could see from a LONG ways away. We got to hang out at their house, enjoy dinner at Grille 29 and a wonderful lunch prepared by Chris, see the “Galaxy of Lights,” and worship with them at Mayfair Church of Christ on Sunday morning. We had an awesome time with the Millers. (1) No Congestion – The race is capped at 1,500 participants, and the marathon is the only race. While having multiple races options can be cool, it often creates chaos. (2) Experienced Runners – Of the 1,500 runners an extremely high percentage appeared to be seasoned marathoners. There were no really slow runners lined up at the front. I didn’t see anyone with their bib on their back. I actually don’t think I saw anyone wearing their race shirt. This is 180 degrees different from a race like Disney World where most of the participants are there to slowly walk the course, take pictures with characters, wear costumes, etc. The people at Rocket City were there to complete a marathon. (3) No iPods – When I first started running in 2007, I always ran with an iPod (lasted until early 2008). Now I’m at the point where it is becoming a pet peeve, especially in races. I’m so tired of getting cut off, stepped on, bumped, elbowed, etc from runners wearing iPods cranked up to 11. There are other races where they claim to ban iPods, but then everyone wears them. At Rocket City this rule is enforced. (4) Awesome Police Support – I honestly think there was at least one police officer at every intersection, and there were a lot of intersections. I never once worried about traffic. Also, the officers were very encouraging to the runners. 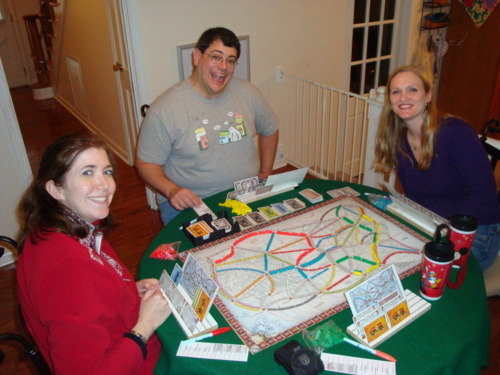 (5) Pacers – It is very unusual for a small race to have pacers, but Rocket City had a wide array of pacers. I can’t speak for the rest of the pacers, but the 3:15 pacer was dialed in. (6) Mile Markers / Split Times – It is also very unusual for a small race to have elevated mile markers, but every marker at Rocket City was well above shoulder level and could be seen very easily. Also, while a few of the major markers had split time clocks, the ones that did not always had a volunteer calling out split times. (7) Volunteer Support – The volunteers were awesome and knowledgable. From calling out split times, to working aid stations, to post race support. (8) Post-Race Food & Services – This was probably the most impressive thing about the race. Once I crossed the finish line I immediately noticed a long line of volunteers. Each volunteer had a mylar blanket, a medal, and a finisher’s hat. A single volunteer came up to me and stayed with me until I was inside the Holiday Inn for the post race food. She immediately put the mylar blanket around me and placed the medal on my neck. She asked if I needed medical attention and kept talking to me to make sure I was alert and responsive. She personally got me Powerade and walked me to the entrance to the hotel. She again asked if I needed medical attention, and after I declined she told me where to go if I changed my mind. At the hotel entrance she told me where I could go to get a free post-race massage and where to go to find the post-race food. Once inside the hotel, the food was absolutely perfect. So many races have things that just don’t sound good after running a marathon (pizza, BBQ, etc.) They had water, Powerade, and chocolate milk to drink. They gave us brown paper bags for all of our food (the only other race where I’ve seen this is the 500 Festival Mini Marathon in Indy). They had bananas, apples, oranges, bagels with peanut butter or jelly (or both), hot soup (awesome), moon pies, ice cream sandwiches, etc. In addition to this, they had an entire conference room reserved just for runners and their families to go in and eat. One final thing to mention about the post race is that results were available immediately inside the hotel. (9) Swag – Every runner was given a long-sleeve Nike technical shirt and every finisher received a technical hat and a very cool medal. Also, they send every finisher a copy of their finish-line photo. (10) Fast Course – While the course is not pancake flat like Chicago, it is mostly gentle rolling hills, with one more significant hill during mile 21. The gentle roll helps keep all of the leg muscles engaged unlike a flat course. The only criticism I have at all is the lack of organization or consistency within the aid stations. They were well positioned on the course and all had Powerade and water. However, I never knew what to expect. Sometimes water was on the left side of the road with Powerade on the right. Sometimes water was in the front with Powerade in the back (or vice versa). Or sometimes it was all mixed up. At one point I saw a volunteer with Powerade in one hand and water in the other. 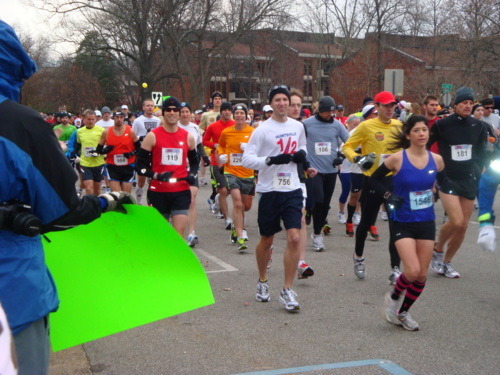 The Course: The out-and-back course starts in downtown Huntsville beside the Holiday Inn, and heads south for approximately 15 miles before going back north. As I mentioned above it is mostly gentle rolling hills, with one more significant hill during mile 21. The first 9 miles have a LOT of turns and go through various residential neighborhoods after leaving the downtown area. Miles 10 to 15 are a single long stretch on Bailey Cove Road. Turning north there is a good mixture of major roads and residential neighborhoods. The final 5 miles are essentially the reverse of the first 5, with the finish line just outside the hotel. There is nothing extraordinary about the course, but it was generally pleasant. There were a few quirky things like running through two parking lots, one sidewalk, one pedestrian tunnel (both ways), and even a little bit of grass.